Many sodium, metal halide and fluorescent lighting fixtures out there contain magnetic ballasts that cause the light to flicker, which has been known to produce symptoms of eye-strain and fatigue. These issues are even more prevalent when taking photos or videos, the lighting will produce visible bands as it flickers at twice the rate of your AC input frequency, typically at 100hz or 120hz. Our plasma lamps come standard with electronic inverter power supplies which are both lighter and more reliable than these types of ballasts and offer a truly flicker-free lighting solution. This combined with high CRI values makes it the perfect light to combat seasonal affective disorder and ideal for public spaces where the health and performance of your customers or employees are at stake. 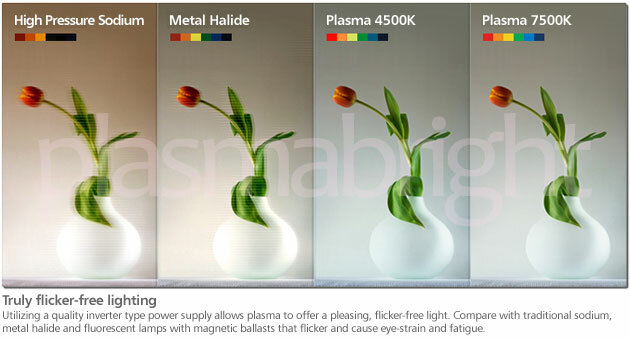 How Does Plasma Lighting Work? ©2010 PlasmaBright. All rights reserved. Specifications are subject to change without notice. We are not responsible for typographical errors. All typographical errors are subject to correction. Actual product appearance may differ slightly from images on this website. Questions? Please call us at (562) 448-2050.